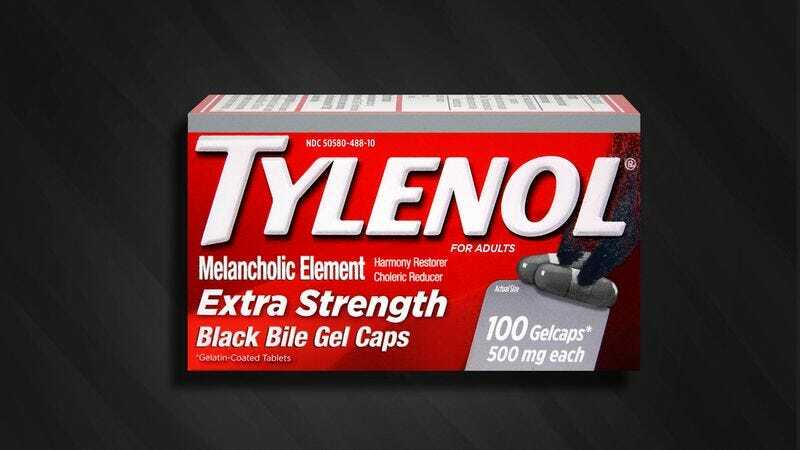 NEW BRUNSWICK, NJ—Offering immediate, over-the-counter relief to anyone suffering from a sudden misalignment of the four temperaments, Tylenol released its new black bile gel caps on Tuesday for people with unbalanced humors. “Simply take two bile caps when you feel a choleric disposition coming on, and you’ll start to notice harmony restored to the body and spirit within minutes,” said spokesperson Jamie Suarez, adding that each capsule is filled with enough of the melancholic element to draw out any predominance of yellow bile, blood, or phlegm, restoring physical, mental, and emotional vitality for up to 12 hours. “In addition to black bile gummies for children, it will also come in an extra-strength formula for people whose infirmities of constitution stem from even the most severe manners of dyscrasia and bodily imbalances.” Suarez went on to say that Tylenol has plans to complement the gel caps with soon-to-be-released home bloodletting and fire cupping kits.